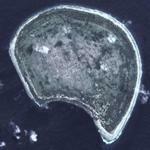 Banaba Island, an island in the Pacific Ocean, is a solitary raised coral island west of the Gilbert Island chain and 185 miles (298 km) east of Nauru. It is part of the Republic of Kiribati. It has an area of 6.0 km², and the highest point on the island is also the highest point in Kiribati, at 81 metres (266 ft) high. Along with Nauru and Makatea (French Polynesia), it is one of the important elevated phosphate rich islands of the Pacific.